Sir Mike said US anti-terror strategy was "inadequate"
The head of the British army during the Iraq invasion has said US post-war policy was "intellectually bankrupt". In a Daily Telegraph interview, former chief of the general staff, Gen Sir Mike Jackson, added that US strategy had been "short-sighted". He said former US defence secretary Donald Rumsfeld was "one of the most responsible for the current situation". 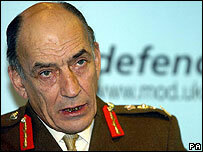 The Ministry of Defence said Sir Mike was a private citizen who was entitled to express his views. Sir Mike told the Daily Telegraph that Mr Rumsfeld's claim that US forces "don't do nation-building" was "nonsensical". The Telegraph reports that in Sir Mike's autobiography Soldier, which is being serialised in the paper, he said the US approach to fighting global terrorism was "inadequate" as it focused on military power rather than diplomacy and nation-building. In the book, Sir Mike also said Mr Rumsfeld had refused to deploy enough troops to uphold law and order in Iraq and had rejected plans for administering Iraq drawn up by the US State Department, the paper says. The criticism comes as the US military said an order from radical Iraqi Shia cleric Moqtada al-Sadr to his Mehdi army militia to freeze operations for six months would allow coalition forces to concentrate their attentions on al-Qaeda. A US statement said the instruction would mean fewer kidnappings, killings and attacks. 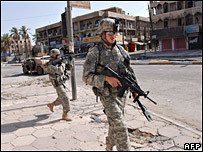 He said: "What has happened in the south, as throughout the rest of Iraq, was that primary responsibility for security would be handed to the Iraqis once the Iraqi authorities and the coalition were satisfied that their state of training and development was appropriate. US military adviser Gen Jack Keane said last week that American commanders had expressed "frustration" over the prospect of UK withdrawal. Sir Mike's criticisms were backed by Sir Malcolm Rifkind, former Conservative foreign secretary and defence secretary. Sir Malcolm told the BBC: "I think one of the most fundamental criticisms is not just that Rumsfeld was incompetent - which he was - but it was actually his boss, George Bush, who actually made the extraordinary decision to put the Pentagon and Rumsfeld in control of political nation-building after the actual war ended." Last week, Prime Minister Gordon Brown wrote to Mr Campbell, rejecting the Lib Dem leader's call for a timetable for withdrawing UK troops.